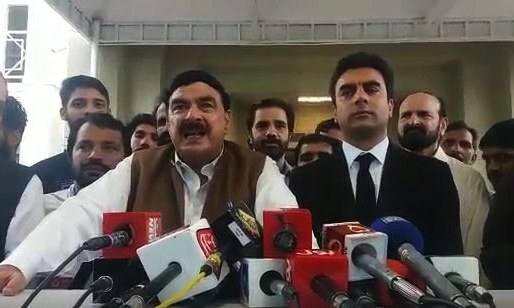 The Lahore High Court (LHC) on Monday rejected Awami Muslim League (AML) chief Sheikh Rashid's petition against the postponement of polls for NA-60 (Rawalpindi-IV). Announcing the judgement it had reserved on Rashid's application, LHC's Justice Mujahid Mustaqeem upheld the Election Commission of Pakistan's (ECP) decision to postpone the election in the said constituency. The ECP had deferred the poll in NA-60 after Rashid's main rival — PML-N's Hanif Abbasi — was disqualified after being sentenced for life in the so-called 'ephedrine case' last week. 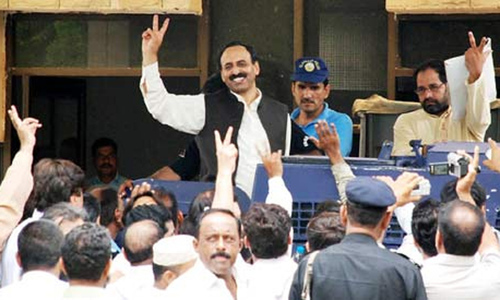 Rashid today reached the LHC's Rawalpindi registry to petition against the ECP's decision. His stance was that the election can only be postponed by a returning officer (RO) if one of the candidates passes away. His petition stated that the ECP had no right to postpone the election for any other reason. Rashid later reached the SC with his application, where he said that the LHC registrar had not marked his case for hearing despite him waiting for five hours. Soon after Rashid approached the SC, his case was set for hearing to the LHC, which later reserved its judgement on the matter after hearing his arguments. The ECP, as well as the lawyer for another candidate from NA-60, Rashid Gardezi, had opposed Rashid's petition. Gardezi's lawyer had asked what would happen if the elections were given a go-ahead and Abbasi received "hundreds of thousands of votes" in defiance of his disqualification. Justice Mustaqeem inquired about the possibility of printing new ballot papers, at which the ECP's lawyer said that it would take a lot of time to print new ballot papers for the 700,000 voters residing in the constituency. He further stated that all possibilities had been taken into consideration by the ECP before reaching the decision of postponing the election. The ECP had on Sunday announced that polling in the NA-60 constituency has been postponed due to Abbasi's disqualification by the Control of Narcotics Substances (CNS) Court of Rawalpindi a day earlier. As the ECP is "bound to provide a level playing field to all candidates [...] the general election in NA-60 is postponed and will be conducted after the scheduled general elections, along with other postponed elections," the commission had said. If the ECP can postpone the election of this seat then what about other seats where the candidates have been killed..
under the circumstance, ECP is decision is right and fair. Rashid is correct, if someone had been caught in heroin case, it is not Rashid fault. Rashid must give go ahead of schedule polling. This is unfair for Sheikh Rasheed. ECP should postpone election and allow PML-N to field new candidate to replace jailed candidate. Only then election can be considered fair. Simple solution could be that while handing over the ballot paper to individual voter the name of the convicted candidate be marked as crossed. Rashid wants a walk over. That is fairness to him. Sheikh is afraid of his loss. Logically, speaking there is no reason to postpone the elections in the constituency in the wake of conviction of Mr. Hanif Abassi, The ECP should withdraw its notification and issue an order announcing the election of Mr. Sheikh Rashid, as an un-opposed candidate, if there is no other candidate contesting the election. Why is Mr SR so scared of competition. Let PMLN pick another candidate for fair play. Another candidate can be appointed over-night from PML-N. So, there would be no loss of new ballot papers. ECP has made a bold and correct decision. Why should Sheikh Rashid get a walk-over? Why the elections in Mariyam Nawaz's constituency still have a go ahead after her conviction. Very fair decision,one hands say ECP is partial &other impartial?Right direction ,Why Sheik Rasheed went to SC?? It was PML (N) duty to have a covering candidate not of Sheikh Rasheed !!!! 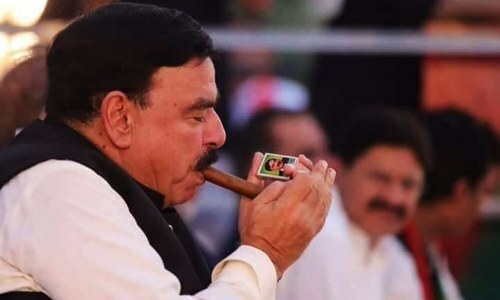 Forget everything just remember Sheikh Rasheed will win that seat. This is unfair for Shekh Rasheed. The results of 25th July will affect him a lot in bio elections. @Arif Kaderbhoy election in those constituencies automatically stand postponed. it is not ECP's responsibility to make sure every party has a candidate in every constituency. If a candidate has been disqualified, its neither ECP's nor other candidates fault. If anyone is being effected, its the people who wont have any representation in parliament for quite some time. This is no good reason to postpone election of this constituency. It is not fair to Rashid. @FN only then it would be fair? They gave a ticket to a convicted criminal on bail. It's their own fault. Election is not for sake of Rashid or IK. It is for people to select their representatives. Rashid, please win in all openness. Sheikh Rashid wants to capitalize on this opportunity for a free ride. I can't say anyone can blame him for trying. Unfair decision. Mr. Sheikh Rasheed is being denied his right to contest election without his fault. I am sure the superior court will set aside the undue decision of the LHC and will allow Mr. Sheikh to contest for election on the general date of elections in Pakistan. A NRO has already been given to PPP and PML-N. PTI will wake up after selections I mean elections as always. ECP, why postpone? The crook has been sentenced life. Why not let it be fair? why did ECP allow Hanif abbasi to contest the election and print 700,000 ballot papers when knowing full well he has a criminal case against him? shouldn't they told him to get aquital and try again next year? what if his case was delayed after the election and he got elected but then got jail for life? it doesn't make sense does it !! ECP wasted tax payers money on printing 700,000 papers with a man who was going to be jailed ! @Arif Kaderbhoy i think they have already been postponed. Although I am in favor of ensuring that all parties should be given equal opportunity to float their candidates, however considering that PML N chose to field a candidate who had so many question marks on his eligibility and candidates, it will not be fair for other parties who have already spent heavily on their campaigns. Ideally RCP should as an exception allow PMLN to field an alternative candidate, without affecting the campaigns of other candidates. The voters from NA-60 are in confusion about casting their votes for the Provincial candidates. Will they be required to go twice for casting the vote; i.e on 25 July & then when new schedule is announced exclusive for NA-60.